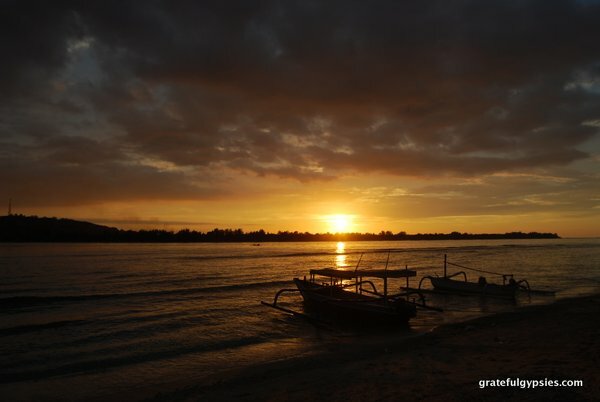 Gili Meno is the smallest of the three Gili Islands. Located in the middle, it’s very much like the middle child in that it’s overlooked. With a permanent population of only 400 people, it has the most deserted island feeling of the three. As such it is very popular with honeymooning couples looking for a romantic escape, or families seeking some peace and quiet. Many people believe it has the best beaches of all the Gilis, however it doesn’t have quite as top notch hotels as Gili Trawangan. That being said, there’s still a surprisingly wide range of accommodation here. 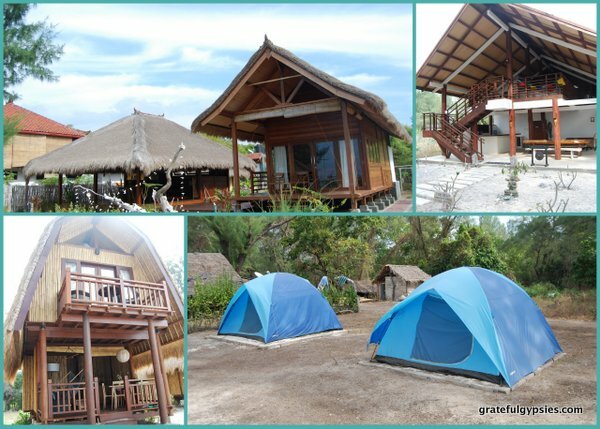 You can find simple thatched huts on the beach, homestays in the village, a luxury boutique resort, private villas, and even an eco-hostel with tents and hammocks. 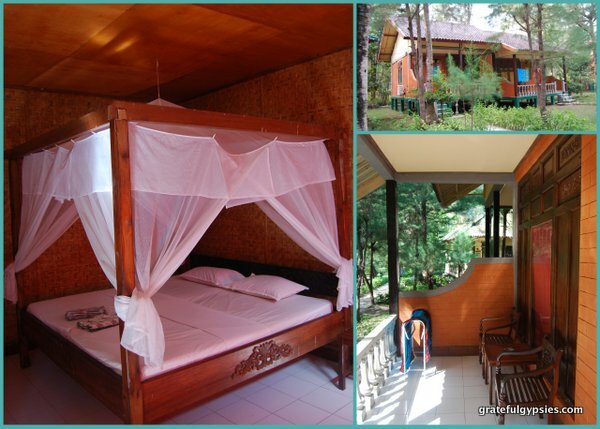 For our very short stay on Gili Meno, we went with the Kontiki Cottages. We got a simple but comfortable private room with a fan and mosquito net (about $25/night), and enjoyed their beachfront location along with the free breakfast. Walking around the lake, looking for birds. 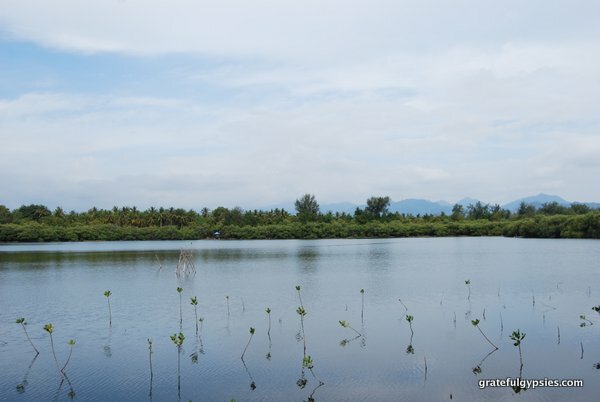 For those who need a bit of activity there is a salt water lake on the west side of the island where you may see some wildlife. There’s a walking path that goes all the way around the lake, making for a nice break from the beach (if you need one, that is). Taman Burung is the name of the bird park where you can see many different types of birds – great for bird watchers. If you didn’t see any sea turtles in your snorkeling adventures, there’s a sea turtle conservatory on the beach where you can see them. The conservatory collects the eggs before they hatch and provides the baby turtles a safe place to grow to a point where they can take care of themselves. Then they are released back in to the wild. 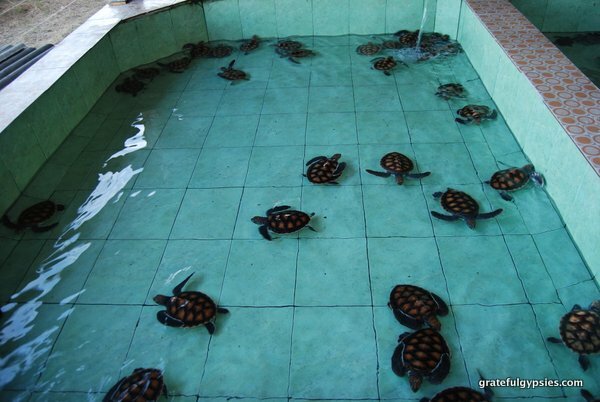 You can make a donation to help this worthy cause and if you donate 100,000 Rupiah ($7.50) you can choose and release a turtle into the ocean. As with the other two islands, diving and snorkeling are also an option here. You can see the famous Gili Meno Wall where sea turtles hang out during the day among the colorful corals and Moray Eels swim about at night. 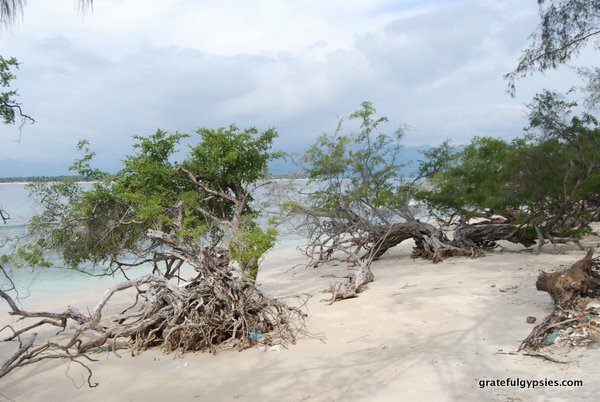 Gili Meno has a walking path that goes all the way around the outer edge of the island. It takes about an hour and a half to walk the full loop at a leisurely pace. 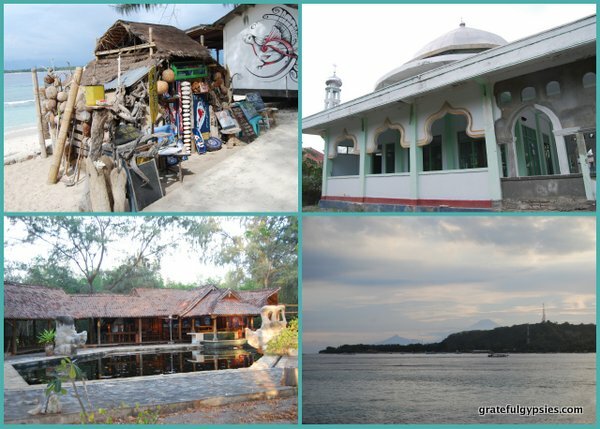 You’ll see quite a few interesting things on your walk, from funky shops, to the island’s mosque, to an abandoned resort. 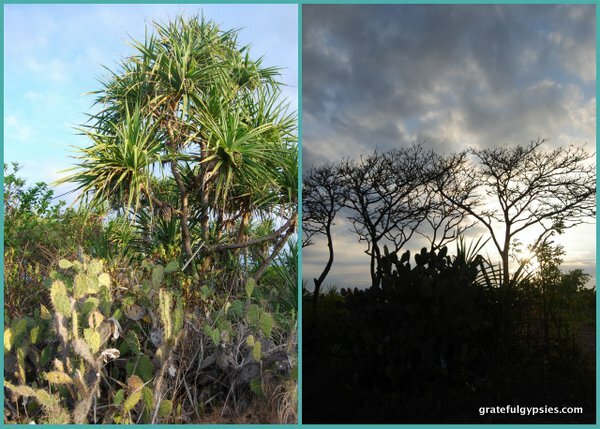 You may notice the flora and fauna are slightly different from Bali – that is because the Wallace Line runs between Bali and Lombok. It separates Asian from Australian species. It is most notable in bird species as they do not cross open oceans. If you begin your walk in the late afternoon on the west side you’ll be back to where you started just in time to enjoy the sun setting behind Trawangan. Our one dinner on Meno. Not surprisingly, there aren’t nearly as many options for eating and drinking on Meno as there are on the other two islands. You’ll most likely get breakfast included with your accommodation, hit a beachside spot for a simple lunch, and then choose one of the many seafood BBQs for dinner. As far as nightlife goes, there really isn’t any. The We Be Bar has bonfires from time to time in the high season, but other than that your only option is drinking arak and hanging with locals while they play a little guitar. 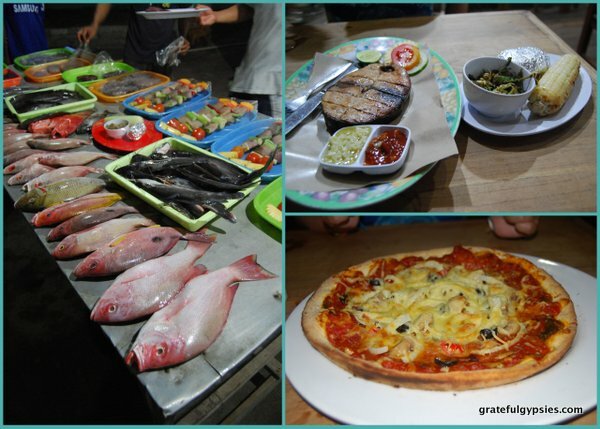 While you’re at it, you might as well check out the other two islands – Gili Trawangan and Gili Air.